Frank Lloyd Wright designed houses, churches and museums, but the great Prairie architect also designed a book or two. The most significant was called The House Beautiful. 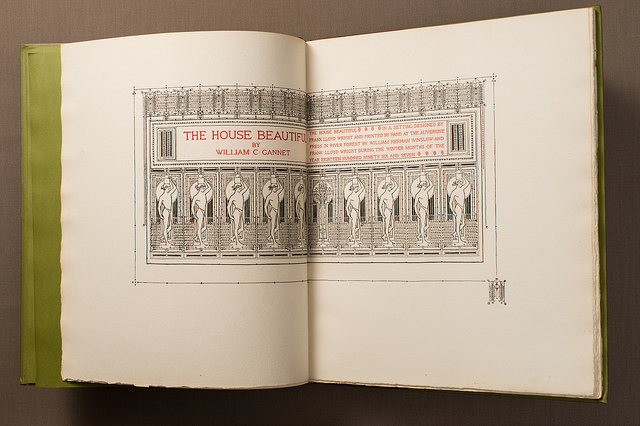 Only 90 copies of The House Beautiful were printed, and fewer than 30 are accounted for. It was 1896, two years after Wright completed the Winslow Home in River Forest. Owner William Winslow had a printing press in the basement, and the 27-year-old architect suggested that they print their own edition of a recently published book that he admired. The book was an essay by the Unitarian Universalist, minister William C. Gannett. Its theme was that spiritual and intellectual health could be enhanced by a beautiful living environment – something perfectly aligned with the organic architecture Wright was developing. Wright chose tapestry-like design elements and even took photos of wildflowers and weeds from the nearby prairie. “I went out and gathered seed pods and deduced from them a certain ornament with which I embellished the volume, and bound some photographs which I myself made,” he told an audience in 1955. Wright also had a hand in publishing a smaller book, The Eve of St. Agnes, on Winslow’s press. It was made in that same “do-it-yourself” spirit of the era’s Arts and Crafts Movement. The Chicago History Museum owns a copy of The House Beautiful. So do the Ryerson & Burnham Libraries of The Art Institute of Chicago, and the Oak Park Public Library. But these are extremely rare books, and your library card or admission to the museum won’t gain you access. New copies rarely surface, making their auction estimate difficult to judge. A facsimile from 1963 sold for $950. So check your grandparents’ bookshelves. They may have a copy of the “Wright” book. In the meantime, Chicago Tonight is pursuing a televised story on The House Beautiful to air in the coming months. We’ll keep you posted.